Flower pictures are hard. Quite hard, in my opinion. Most of the time, something is wrong. A blossom is too far open, or too far closed. The way they happen to be arranged doesn’t yield a good composition. The light isn’t right. The background is too busy. The list of potential problems goes on. Last week, I was already out the door on my way to work, when these Honey Perfume roses on our patio caught my eye. I instantly knew I had something good. The first thing that attracted me was the rose blossom that was about half way open. It virtually begged to have its picture taken (incidentally, the day turned out to be really hot and by evening the same rose was way past its prime). However, everything else came together as well. I liked the overall composition, the light was good, the background (still in the shade) was perfect, and little details such as the morning dew on some of the leaves (and even on the yellow rose petals if you were to see the original in full size), just added an extra touch. I didn’t do much in terms of processing, but I did darken the bottom part of the image a bit because I felt that otherwise it would have distracted from the center of attention. 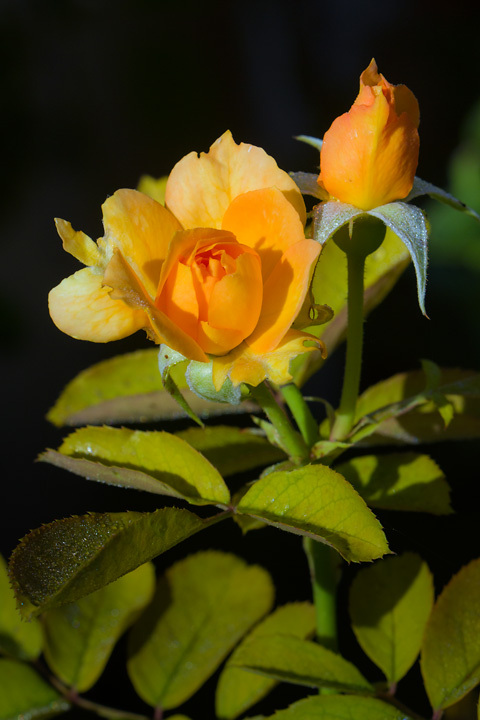 This entry was posted in Picture of the Week and tagged canon eos 60d, nature, outdoors, roses. Bookmark the permalink. Reminds me of roses painted by Catharina Klein (b.1861-d.1929). That’s a compliment, by the way!